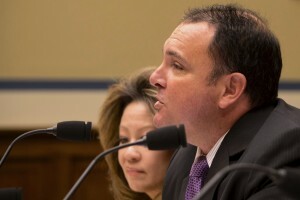 Robert MacLean at Sept. 9 Congressional hearing. Last week, supporters filed eight more “friend of the court” (amicus curiae) briefs in support of Robert MacLean, the whistleblowing former air marshal whose case, DHS v. MacLean, is now before the US Supreme Court. Supporters include the Office of Special Counsel, a civil rights organization, a government watchdog group, an employee union, two federal employee associations, twelve former government officials, two U.S. Senators (Grassley and Wyden) and four Representatives (Issa, Cummings, Farenthold and Lynch). All that’s missing is a partridge in a pear tree. DHS has petitioned the Court to overturn a unanimous lower court ruling in favor of MacLean, who blew the whistle on a TSA plan to leave air travelers unprotected by air marshals after the TSA received word of a possible terrorist attack. Embarrassed agency officials fired MacLean, claiming he improperly revealed “sensitive security Information” (SSI), although the agency didn’t mark it SSI until after its disclosure. Sadly, Mr. MacLean lacked the time machine necessary to comply with TSA’s post-hoc requirements. A ruling in favor of DHS, the amicus briefs warned, would be a public policy disaster, allowing agencies to misuse SSI designation authority to hide wrongdoing, evade accountability, and neutralize the Whistleblower Protection Act. Reading the briefs, it’s hard to imagine that anyone, other than the government itself, would support the DHS’ position. Indeed, no one has. Credits: Photo by Linda Lewis.